Speaking to anyone who makes beer for a living, you’ll undoubtedly hear that it’s not a financial tiptoe through the tulips. Long hours, no holidays, endless debt and putting your monetary stability on the line seem to go hand in hand with getting people drunk in new and interesting ways. One of the ways, it appears, of keeping afloat as a small brewery is to hunt for a gimmick and make a beer based on that. These gimmicks are usually ones that are related to produce in the local area, and are sure to keep the tourist pennies rolling in. It probably explains why Japanese craft beer is more commonly known as “地ビール”(Ji-biiru, local beer), although the industry is pushing towards using “クラフトビール” (Kurafuto biiru, craft beer), ostensibly to be in line with the rest of the world. There is a second reason why Japanese craft brewers are eager to correct you when you say 地ビール, however. A rather embarrassing past that they’d rather you forget, as they were young, and in college, and needed the money. In this case, it involves potatoes, pink food dye, and catnip. Read on. Abashiri Jyaga Draft, then, is Abashiri Beer’s potato-based beer. It’s meant to evoke autumn in Hokkaido, and has a nice rustic handmade design to the label, albeit with a bizarre choice of the typewriter font for the English writing on it that make it looks like a conspiracy theory website. The ingredients look like they don’t belong in a beer at all- the first ingredient is saccharine starch; the third barley syrup. Then there’s the jagaimo (potato) and nagaimo (yam), and the bizarre inclusion of matatabi (catnip). Hops are only greater in amount to the two red dyes. And before I forget, it has an abv of 5%. You think this is lurid, wait until you see the Okhotsk Blue. Rob refused to review this beer. Abashiri Jaga Draft pours out a slightly pink, slightly brown mix that gradually diffuses to a watery brown over time. Nothing like the fluorescent cocktail colour on the label. The nose is very faintly of imo-jochu (potato-based shochu spirit). I like imo-jochu. I’m not entirely disgusted by this. Ok, I just tasted it. Now I am entirely disgusted by this. Remember when I said that the top ingredients are saccharine starch and syrup? Yeah, turns out, that wasn’t a lie. Abashiri Jaga Draft is the sweetest beer I have ever tasted. And not in a nice way like a honey ale or a milk stout. This is like someone has dumped a load of syrup packets in my beer when I wasn’t looking. It’s absolutely foul. The only saving grace is that with the inclusion of the potato, it tastes a bit like those purple sweet potato tarts you can get as souvenirs. I love those. This, however, is not a delicious sweet potato tart. This is a drink. And not a very good one. I realise that a brewery in the arse end of Japan’s freezer section must do anything to survive when they have to dig their way to work in winter, and that a gimmick beer is perfect. After all, they’re not going to get many beer nerds coming up to stroke their beards over the newest appellation of their golden ale or whatever. Having a sense of community spirit by using local produce is also great. 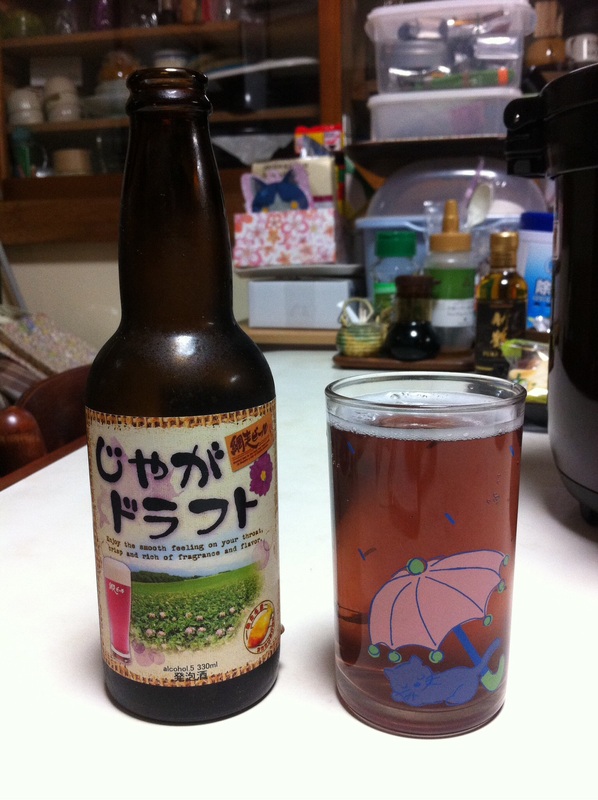 However, as I mentioned in the beginning of my review, Abashiri Jaga Draft is not a Craft Beer. It is a Local Beer. There is, and I’m not exaggerating, also go ahead and call me a Beer Ponce, a huge difference. You could say that Local Beers are a product of the first craft beer boom- where the weird and wacky flavours were the same as super-sour plums or ultra-spicy sembei you’d bring back as souvenirs. These days, though, we just want something nice to drink. Abashiri Jaga Draft is not something nice to drink. Abashiri Jaga Draft can be bought from the Abashiri Beer online store here. I got my bottle from Rob via the Seibu chain of malls but he has seen it in Le Collier in Tokyo. I have tried the Okhotsk Blue once. That was enough. I bought this bottle in the Dosanko Plaza at Meitetsu’s department store in Nagoya. The Dosanko Plaza (http://www.dosanko-plaza.jp/shop/) in Nagoya displays lots of souveniers of Hokkaido, including a variety of Sapporo’s special beers, and two local beers: Okhotsk Blue and the Susukino Pilsner (canned version – did not like it very much). Abashiri Beer does actually make one drinkable beer, the Abashiri Premium. I bought one bottle a while ago, but do not remember where it was (maybe at Kyoto station, or at Seijo Ishii somewhere, but not in a Dosanko Plaza). The Blue is lurking in my fridge awaiting review. Think I’ll open it next week once I’ve plucked up the courage. Thanks for the comment, Oliver. I spotted the whole range in Le Collier as well as Aqua Vitae in Yokosuka. The premium and the Prison Black draft are both in my fridge at the moment though the green one is waiting for Joe. The Okhotsk Blue was one of the reasons for us starting this site, promote the great craft beers that are out there in Japan that people might not have heard of. Some of us will come to Nagoya soon so let us know of any places you’d recommend or know of to buy craft beers. I have not found any specialist shop in Nagoya selling craft beers, so I often use Rakuten. The best selection is probably available around Nagoya station, where the usual shops are: souvenier sections of the station kiosks and department stores (B1 floor of Meitetsu’s Men’s building, behind that Dosanko Plaza with a pretty small selection; B2 floor at Takashimaya is a bit better, but still not much compared to other department stores). Kitano Ace at the B1 floor of Kintetsu has a bit, as does Seijo Ishii in Nagoya and Kanayama. Morita Kinshachi beers are widely available, and there are a few other local beers (Ise Kadoya, Inuyama Loreley, Ageuma) at some places too. I have never checked the department stores at Sakae, though. Nagoya University’s seikyo (coop supermarket) sells Nagoya University Beer (pils, weizen), both are brewed at Loreley. Biermarkt in Motoyama is good for Belgian beers (http://biermarkt.jp/), but I do know know if they also sell Japanese ones. I finally found a shop in Nagoya selling craft beer: Okadaya. http://www.sake-okadaya.co.jp/ (although their homepage does not list beer at all). It’s a great shop and one we’ve already got listed on the site. The online store is good as they tend to have all the beers in stock. Only disappointment is the lack of Hurricane beers and Loco beer; first is understandable as the brewery closed down, the second is weird. A friend popped down to 7 days brew and enjoyed it too. He should be writing a review of it over the next week or so.